I'll tell you why that bird looks so angry, because his basketball team stinks. 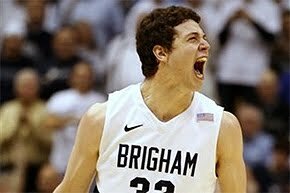 Brilliant coaching by Dave Rose and serious execution by Jimmer and the crew. What a weekend! Yeah, I had Pitt going to the championship game. Oh well. The BYU game was great! I don't know what I am going to do with myself for the next few days.